Triggerfishes are about 40 species of often brightly colored fishes of the family Balistidae. Often marked by lines and spots, they inhabit tropical and subtropical oceans throughout the world, with the greatest species richness in the Indo-Pacific. 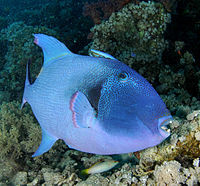 Most are found in relatively shallow, coastal habitats, especially at coral reefs, but a few, such as the aptly named oceanic triggerfish (Canthidermis maculata), are pelagic. While several species from this family are popular in the marine aquarium trade, they are often notoriously ill-tempered. Filefish (also known as foolfish, leatherjackets or shingles) are tropical to subtropical tetraodontiform marine fish of the diverse family Monacanthidae. Found in the Atlantic, Pacific and Indian Oceans. Filefish are closely related to the triggerfish, pufferfish and trunkfish. Their laterally compressed bodies and rough, sandpapery skin inspired the filefish's common name; it is said that dried filefish skin was once used to finish wooden boats.